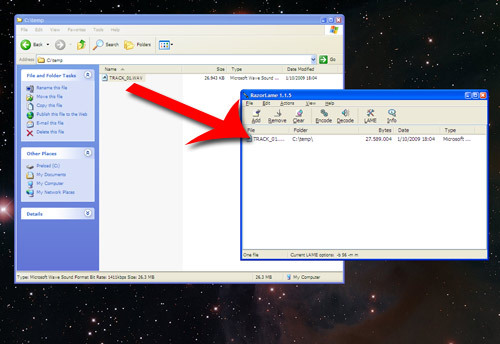 This ultra-small tutorial explains how to watch dreambox satellite TV on your PC using the latest version of VLC. If you have problems getting it to work try the comments section, maybe I can help. Note: When installing VLC , by default the “mozilla plugin” isn’t installed. You need that plugin to watch Web-X-TV. Check the box “mozilla plugin” while installing VLC. VLC player should start playing whatever TV program that is currently playing on the dreambox. NOTE: Change video.m3u to audio.pls to listen to the audio only. TIP: Use the webinterface to change programs. Please continue to the updated post. There is a new Twitter phishing scam making the rounds, and this one is spreading quickly via direct message, wrote by Ben Parr on Mashable.com in October. Indeed, when using Twitter, I have noticed a lot of DMs in my inbox containing weird messages accompanied by a short URL. Twitters @SPAM acount wrote a few days ago: Getting weird DMs? Probably due to phishing. Don’t go to the links sent in the DMs or give out your login & PW! It seems like the problem is spreading. The phishing and spamming on Twitter is going on since January! Typical messages look like hi, find out if your iq is higher here http://pei****e.info or you’re on here lol http://v***tter.dfhjkdh.com. They know just how to get you curious enough to click the link, so it’s best to refrain from clicking any link in your DMs for a while. The link takes you to a Twitter login page. If you enter your password, rogue spammers abuse your twitter account to send private messages to you followers, possibly infecting them too. So don’t do it! If you think some application is sending DMs in without your permission, look to revoke the permission rogue apps have at http://twitter.com/account/connections and change your password at http://twitter.com/account/password. Making the perfect MP3 is still a challenge. 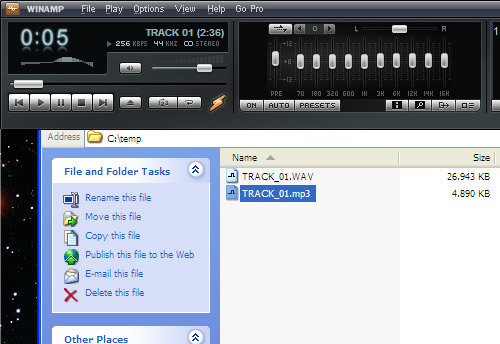 When looking for an MP3 encoder, the software that creates the MP3’s, you’ll find an abundance of programs available. But not all of them get the job done. In this edition of “make a high quality MP3” we go for encoding WAV files into MP3s using the LAME MP3 encoder. This encoder is widely accepted as the best free alternative for expensive commercial encoders. It’s very fast, it produces high-quality files and has many advanced features. 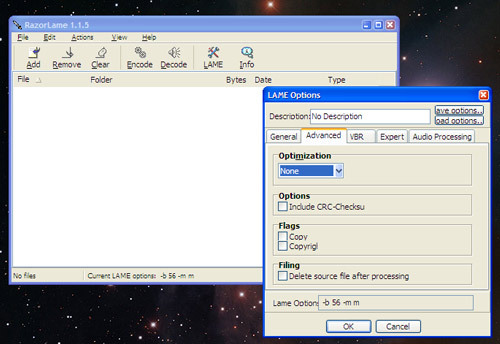 Unfortunately LAME is a command line utility. To get the familiar graphical user interface, we need a front end. A front end is a piece of software that communicates between you and a command line utility through a graphical user interface. Razorlame is exactly the software to get this done. Setup is easy. Download Razorlame and extract it to a folder. No additional setup is required. We included a recent version of Lame. Now that’s done, let’s see at some basic features of Razorlame. RazorLame should be quite straightforward. 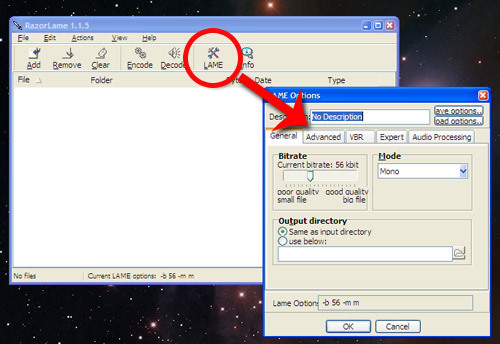 LAME offers a great variety of options, so does Razorlame. To find out what an option does, hover with the mouse a few moments over the control and a hint will appear (most of the time). 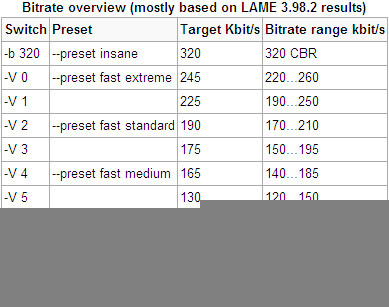 Bitrate:: The higher the bitrate, the better the quality, but higher bit rates create larger files. Also note that not all devices can cope with hight bitrates. 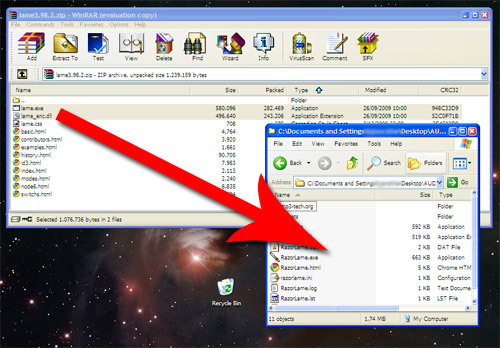 I suggest to use 128 kbit for portable devices, 192 kbit for car MP3 players and 256 kbit for archiving. The difference between 256 and 320 kbit is unnoticeable for 99% of the listeners. Mode: Choose between stereo or mono. Joint stereo gives somewhat smaller files, but it distorts the stereo image. Output Directory: Choose between storing the resulting output in the same directory as the source OR point the output to a specific directory. Optimization: Choose between speed or quality. Quality is slower, while speed results in (somewhat) lower quality. Include CRC Checksum: Check this if you want some protection for bit errors. It makes the files larger. CRC does not protect for large errors, some believe CRC prevents corrupted MP3’s from playing all together, while without CRC the files plays, even when there is some minor corruption. I suggest you leave it unchecked. 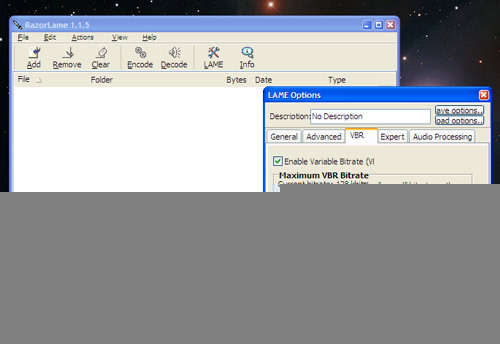 Variable bitrate (VBR) files vary the bit rate in function of the complexity of the sounds it needs to encode. The advantage of VBR is a better quality-to-space ratio compared to a CBR, but the encoding is more complex (slower) and the results are incompatible with some hardware. Maximum Bitrate: This is the maximum bit rate a segment can have. If a passage of music is very rich (high frequencies) it will switch to this bit rate during that passage. When the music becomes less complex, the bit rate drops to a lower rate. You can set the lowest bitrate in the general tab. I suggest setting this to 256 kbits and de general tab bitrate to 128 kbits. ABR: ABR is variation on the VBR-style distribution of bitrate, but subject to an overrall target bitrate, rater tha an overall target quality irrespective of bitrate. Some hardware isn’t compatible with ABR. Leave the Expert and Compression tabs as they are for now. Let’s encode a WAV file. It’s the kind of files you’ll end up with extracting audio from CD’s. The process is very simple. Just drag & drop the wav file into Razorlame. Then click the ENCODE button. You can drag multiple files to Razorlame. There you are. You now have a high quality MP3.